Trump downplays bombshell interview with UK tabloid, praises Prime Minister May. Throughout the press conference, both leaders largely sidestepped questions about the interview as they sought to present an image of unity. 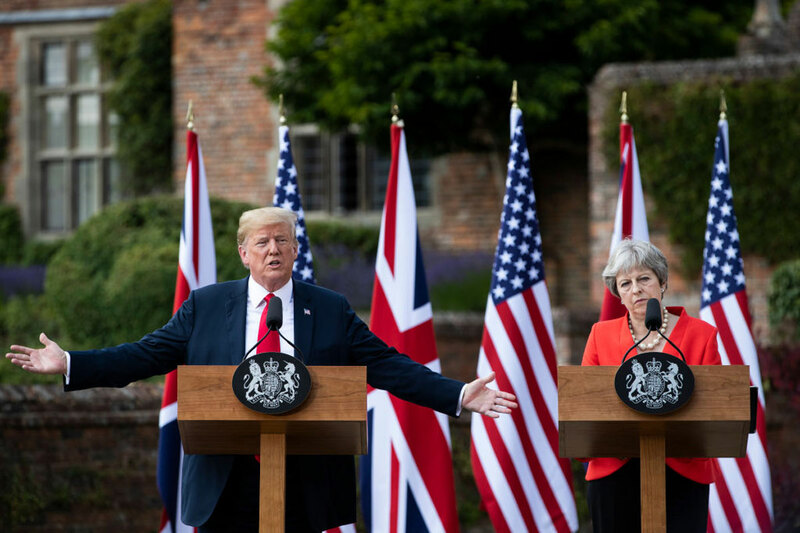 President Donald Trump and British Prime Minister Theresa May held a joint press conference where Trump backed off his criticism about Theresa May’s compromise approach to the United Kingdom’s withdrawal from the European Union. President Trump said U.K. Prime Minister Theresa May is “doing a fantastic job” as British prime minister, and even said he apologized to her Friday morning before their meeting, after an interview published Thursday highlighted his criticism of her handling of Brexit. “I think she’s a terrific woman,” he told reporters at a joint press conference Friday at the country estate of the prime minister, Chequers. The president also called the relationship between the U.S. and U.K. the “highest level of special.” He still thinks, as he told the Sun tabloid, that Boris Johnson would be a great prime minister. Trump’s visit to Britain is sandwiched between the Brussels NATO summit, where he blasted allies over defense spending and trade, and ahead of his meeting with Russian President Vladimir Putin in Helsinki, Finland. On Friday, Trump met and dined with May, who faces her own political challenges, with just days to come up with a new plan for Brexit or face a vote of no confidence in parliament. Two top U.K. officials overseeing Brexit negotiations resigned earlier this week. The President delivered an astonishing political knifing of the British Prime Minister on Thursday, comprehensively undermining her fragile position in Britain’s tortuous negotiations on leaving the European Union and getting his visit to the country off to the most explosive of starts. In an interview with the Rupert Murdoch-owned newspaper The Sun, Trump said May had ignored his advice on Brexit, he praised former Foreign Secretary Boris Johnson — who has just walked out of her Cabinet over the issue — and he said May’s cherished hope of a free trade deal with the US would be killed off by her softened approach. “She didn’t listen to me,” he told The Sun. Reporters questioned President Trump about his commitment to NATO, given his recent criticisms of the organization, and about his upcoming meeting with Putin. On the day before the news conference, the British tabloid The Sun published an interview with Trump in which he said he thinks Boris Johnson would make a great prime minister, and Britain’s trade relationship with the U.S. could come to an end if British Prime Minister Theresa May follows through with the so-called “soft” Brexit blueprint. The president made the comments ahead of meetings with May and Queen Elizabeth. May is promoting the “soft” Brexit plan, which would keep strong economic ties with the European Union. Trump said he advised May how to manage Brexit, but she didn’t listen. He then tried to call on Fox News’ John Roberts, as CNN tried to ask a question. Trump said he didn’t take questions from “fake news” CNN. “We’ll see what happens,” Trump said. “It’s another bad hand,” he said again of inheriting the annexation of Crimea. I’m fixing them one by one, he said of the other “bad hands” from the Obama presidency. May said that what’s important in meeting with President Putin is the position of strength and unity with NATO. “That’s what the British people voted for and that’s what we will be delivering,” May insisted. Trump praised Johnson and said again that he would be a great prime minister. But he also said that May is doing a “fantastic” job as prime minister. She’s going to do the “best,” he said. Trump said he only asked for an “even” deal with the U.K. He complained about E.U. trade barriers and tariffs on cars. He said that the U.S. lost $151 billion to the E.U. I think they better watch themselves, he said. Countries that never had difficulties — I don’t think it’s good for Europe, and I don’t think it’s good for our country, Trump said of immigration. Asked what he hopes to accomplish in meeting Monday with Vladimir Putin, the president touted the “strong” meeting with NATO. He said the two would be talking about Ukraine, Syria, other parts of the Middle East, nuclear proliferation. It’s a “devastating technology,” he said. It’s a “bad policy.” We have no choice. We are massively big and they are very big, Trump said. He promised to bring up Russian meddling in the 2016 election, and said he’d “firmly” ask the question, though he expressed doubt that Putin would make any admissions. He also suggested that the special counsel’s investigation into Russian meddling in the election is an obstacle to his relationship with Putin. He also addressed NATO – “they’re now paying their way,” he said of the other member states. “We have been very strong on Russia,” the president said in response to another question about NATO and Russia. If we get along with other countries, that’s a good thing, Trump said. He stressed the increased contributions of other NATO countries and said Putin wouldn’t like this development. He also mentioned that nuclear weapons are the “biggest problem in the world,” he said. Ideally he’d “get rid of them,” he mused. Trump said he would talk about nuclear proliferation is a subject he said he would bring up with Putin. “I have a lot of respect for the prime minister,” Trump said in response to a question about the Sun interview. It’s “fake news,” he said. He said the U.S. is by far the biggest trading partner of the U.K. He said that the trade is “a little bit tricky,” but said he believes a deal will happen.